I love local fruits and veggies, but I like to use the winter months (when local veggies are a bit harder to find) to experiment with non-local veggies, such as jicama and kohlrabi. My friend Susie was the first to tell me about Kohlrabi (until then I had never heard of it) and I took her advice of just eating it raw. To do this, you have to first cut off the long leafy stalks (which are in fact, edible) and cut away the outer skin. 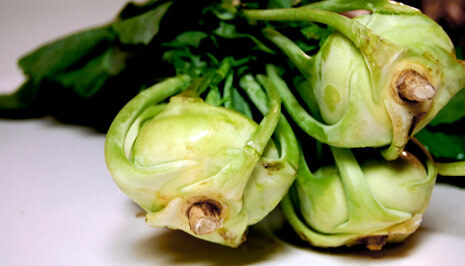 Unlike jicama, which is thirst-quenching and sweet, kohlrabi in crunchy with a flavorful kick (similar to a radish). So if you are looking for something unique, try some jicama or kohlrabi. Or if you are looking for a veggie that is more common but tends to get a bad rap, check back tomorrow when Liz will cover the vegetable that everyone loves to hate (until they try it! ).